When you move into a new house, there’s always something that needs fixing up. A bit of paint and some new drapes may help freshen up the place and put your mark on it, but things like exposed wiring and a very utilitarian looking electrical panel in your front hall are altogether different. Unwilling to live with the mess, [John Whittington] decided to enclose his utility panel and add a Nixie tube IoT watt meter to dress things up while monitoring energy usage. Looking at the “before” pictures on [John]’s blog, we can see why he’d want to invest the effort – not exactly an attractive way to greet guests at the front door. A simple wooden box to replace the previous cover would have sufficed, but why pass up the opportunity to add value? [John] opted for a Nixie tube display to complement the glass of the electric meter. The Nixie modules were a bit on the pricey side, though, so with only a pair of tubes to work with, [John] came up with a clever system to indicate the scale of the display. We doubt he’ll ever see megawatt-level instantaneous power draw, but the meter is also capable of totalling energy use, and as a bonus an ESP-8266 gives lets him stream data to the web. We’ve featured tons of Nixie projects before – everything from clocks to cufflinks. We have to agree that [John]’s Nixie project turned out great, and it’s sure to be a conversation starter with arriving guests. You are reading the first ever "review" of the Akafugu Nixie Modular Clock, a product yet to be released at the time of writing. Per, of Akafugu, generously offered to sell me the PCBs for this Nixie clock; the parts were sourced by myself. The Nixie Modular Clock shares a big chunk of the schematic with its older sibling, the Akafugu Nixie Clock. The goal of this latest design is, I assume from the name, the "modularity". 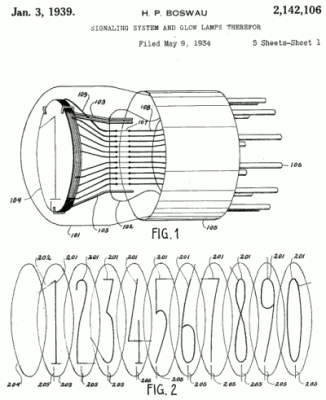 Similar to the VFD Modular Clock, "shields" for various types and numbers of Nixie tubes will probably be developed soon. This Nixie Modular Clock is an Arduino-based, open source project, designed around ATmega328 running on internal oscillator at 8MHz. Like the Akafugu Nixie mk3, the high voltage source (180-200V) uses the MC34063 DC-DC converter, and the driver for Nixies is HV5812. There are 3 buttons: 2 in the back, for setting up the time and alarm time, and another long-stem, protruding through the top board, for enabling/disabling the alarm. An orange LED in the front indicates if the alarm is active or not. The PCB for the commercial version will be red, I was told (as shown below :). Building the clock is straightforward (as long as all parts are in hand, which will be the case when the kit becomes available). The assembly instructions are easy to follow and very clear, with lots of details and helpful photos. Some of the parts I picked (electrolytic capacitors, inductor) were a little too high, so I had an issue with the clearance between the 2 boards. I was able to "correct" that (meaning increase the distance between boards) by using long-legged headers lifted on male-headers plastic insulators (see the photo below). I did not install the lamp between the hours and minutes. I was surprised to see that the unit-hours tube (second from left) blinks its decimal point! The clock has also support for "background" LEDs (blue recommended), but I did not solder those either. ..is also open source and available here. A nice feature that every programmer will love is that it covers both Nixie Clock and Nixie Modular Clock (plus variants of the latter, like 6-tube clock) by using macro definitions. Not to mention that the code compiles and works without a glitch. It also has support for GPS. My suggestion is to make the top plastic plate of the enclosure (shown in akafugu's photo of the clock) transparent, rather than opaque black, which hides the elaborate design/silkscreen of the tube PCB. I think that the Modular Nixie Clock will be another success. Its aesthetics, compact size and feature-rich software set a new standard in the world of Nixie clocks. Remember, most of the Nixie clocks one can buy on etsy, ebay or other sites, are non hack-able hardware or software. If you want one to tinker with, then Akafugu Modular Clock is for you. 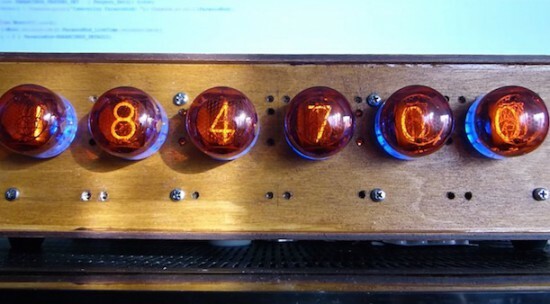 This single-digit Nixie clock is built on a piece of prototype board, as a ProMini shield, similar to two previous miniature clocks, the single-digit numitron clock and the 7-segment bubble clock. The shield holds the Nixie board and the high-voltage power source (both from Taylor Electronics). It also has a couple of buttons to set up the time and 4 LEDs to indicate the digit's position. Like the single-digit numitron clock, time is displayed by showing each of the 4 digits (as in HH:MM). But for a "clearer picture", I added the above-mentioned 4 different color LEDs. One of its nice features is that it works on the rechargeable 3.7V LiPo battery. The clock does not have an on-board RTC (lack of space), relying instead on the time-measuring capabilities of ATmega328 directly. So this clock will keep time for as long as the battery is kept charged (through the USB power cable). The photo below shows my "collection" of (un-synchronized) micro clocks. (Missing is the numitron clock, which requires a stand; I am still waiting for a part to build that). The right-most one follows the same ProMini shield idea, using an I2C OLED display and running the Pong sketch (courtesy of miker). The most popular numitron tube is IV-9, which can be purchased these days on ebay for $5. Size-wise, IV-9 fits perfectly on a Arduino ProMini board, and so it can be soldered directly into the bottom holes of that board. The clock I made displays the HHMM-formatted time as a sequence of 4 digits. Since there is no RTC on board, the processor keeps track of passing time. The rechargeable LiPo battery plays the role of the backup power, in case the USB cable is unplugged. The current consumption is about 20mA per segment, making the clock draw between 50mA and 160mA. With the on board 240mAh LiPo battery, the power would last for a maximum of 2 hours. The display can be turned off (left button) to save power, thus making it suitable as a wearable device (watch). In this case, the clock draws only about 10mA. The right button is used for setting up the time. The numitron clock doesn't get any smaller than this. The only problem I had was with the ProMini bought on ebay. Sometimes they come with no bootloader burned on the microcontroller. Once anything is soldered on the board (e.g. headers), burning the bootloader through the ICSP becomes almost impossible (because of space constraints). Therefore, before including it in a project, always test the bare ProMini by uploading a sketch.